Hobdens is our “hidden vineyard”, tucked away just south of Mayfield. It’s a lovely spot: protected by the Mayfield ridge to the North East and the looming bulk of Crowbourgh Hill to the north west. Between them they keep icy winds off the vineyard in winter and hold back the drenchings of the wet summer westerlies. This is our oldest parcel of vines dating back to our first small planting in 2004 and completed in 2005. It’s a 1.5 hectare south-south-east facing field, at an elevation of 69 to 83 metres. Prior to 1914m it grew hops for the local brew. It is lovely to work in as it is well drained, with a herringbone pattern of land drains, and has a uniform, gentle 5 degree slope. The clay loam over Wealden clay soils, shot through with iron rich shale, are slower to warm up in spring than the sandier soils of our larger vineyard at Lakestreet, generally delaying budburst at Hobdens until the risk of frost is over and then staying warm well into late Autumn as the grapes ripen. Hobdens is planted with five varieties: Pinot Noir, Pinot Meunier, Chardonnay, Pinot Gris and Pinot Blanc. We carefully selected clones that would ripen well with lush flavours and bring different characteristics to the wines. We’ve also trialled different rootstocks to gauge their impact on the vines and wines. Vines are trained to the Double Guyot system (for those that like such details) and by mid summer they form clipped “hedges” above the trunks, carefully spaced so that they don’t cast shade on each other. 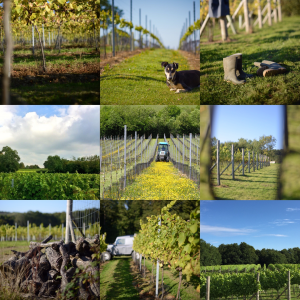 We do a vast amount of work by hand to optimise each vine’s exposure to the all important sunlight. Our part of Sussex is all about ridges with commanding views over the intimate folds of our hills and valleys. Lakestreet Vineyard falls off the ridge line, rolling down from 120 m above sea level to 85m with stop-and-stare views sweeping across Oast houses, bluebell woods and ending on that most quintessential element of the English countryside: the dreaming ancient church spire on one distant hill and a windmill on the other. • Microclimates: Very parcel specific. The soils here are different from Hobdens, more open, ranging from clay loam and silty-sandy clay, where the Chardonnay is planted, to greensand over clays and sandstones for the Pinot Noir and Pinot Meunier. We also grow some Pinot Gris here, mostly on the steepest slopes. The more open soils mean that budburst and harvest are usually ahead of Hobdens by a week. We picked the best clones and rootstocks from our experience at Hobdens and added a few new ones to increase the range, with each clone bringing slightly different attributes to our wines. Vines are more densely planted than at Hobdens; most are trained to double guyot, but the more recent very dense plantings of Chardonnay & Pinot Meunier are trained to Single Guyot. The fruit flavours from the Pinot Noir & Pinot Gris are notably different at Lakestreet, permitting us to produce a number of distinctive & excitingly different cuvées. The fields are named High Field for its commanding views and Hawk Field for the resident Hobbys, mewling buzzards, diving kestrels and the haunting owls. Great Gale, is named after the Great Storm of 1703, which reputedly felled the woodland here three centuries ago. Each field has a special character of its own. Hawk Field and High Field are separated by our ponds and nature reserves, helping us contribute to the natural biodiversity of this part of Sussex.